Cape Adare impossible for the Our Far South team. Well the Our Far South crew are on their way north now. 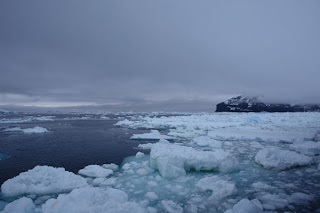 Unfortunately the ice around Cape Hallett and Cape Adare had moved in and made any landing impossible – the first signs of the winter freeze are appearing down here – pancake ice and the coming of night. We did get a good close look at the Possession Islands where a number of our intrepid explorers took a sub-zero dip. We leave with mixed feelings; regret for leaving such a magical place and the anticipation of the welcome call of home we are now heading for Campbell Island which we will reach in a few days time. As we travel north the team is busy with seminars and wide discussions about fishing, climate change and its effects on the Antarctic, and tourism. It’s about time I talked about the lead actor in the fishing scene down here – the Antarctic toothfish. A definite case of beauty being in the eyes of the beholder, the one adjective that first comes to mind is ‘big’. Imagine a blue cod the length of a 12 year old human and of a similar weight, colour it grey, paint a few black bands on its fins, give it several rows of stubby teeth and a wide gaping mouth and you’ll start to get the idea. The ‘Toothfish’ moniker applies more its close cousin the Patagonian toothfish which has a serious row of wolf-like teeth at the front of its jaw – not so it’s more southern relative. Antarctic toothfish can grow to a very large size. The largest I have seen was over 2 metres in length and weighed 155 kg. At this size we generally find that their reproductive organs have atrophied - they are long past the age of spawning. Generally though, they live to about 35 years and by age 13 at least half the males are spawning. Females seem to mature a bit later so that by 16 years at least half of them are reproductively active. We know that spawning takes place during the winter, when the Ross Sea Region is covered by ice, on the shallow hills and ridges of the Pacific Antarctic Ridge to the north of the area. Some of the research I have been working on indicates that before they spawn they feed up and gain condition in the more southern 'slope' region (a steep area of seafloor where the shallower 'shelf' descends into the deep sea). During this time we think that they 'bulk up' and store energy as lipid fat - like fuel if you like - to sustain them over their spawning period in the north, where food is more scarce and toothfish are crowded on restricted grounds. As most spawning has finished by the start of the season it is uncommon to find fully developed females. The few that I have seen have carried huge egg masses, one fish I examined of about 60 kg in weight contained 26 kilograms of eggs, a huge investment in reproduction. The eggs are large - about 3mm in diameter or the size of tapioca, but still very numerous. What happens next is still not fully understood. The most likely hypothesis, and one we are now piecing together with direct observations, is that the eggs and larval fish drift with the easterly flowing currents associated with the Antarctic Convergence and possibly reach as far as the Drake Passage between Antarctica and South America; in fact, some may continue further eastwards into the Scotia Sea. Generally however, as the small toothfish develop they move south close to the coast and ice shelves where there is a westerly flowing counter-current, the Antarctic Coastal Current. Over a number of years as they grow larger they continue a gradual movement back westward. We can see this trend when we measure the lengths (sizes) of these 'juvenile' fish from different areas of the shelf along the Pacific sector of the continent. In fact this measurement is a major aim of the pre-recruit survey that I have already covered in another blog. Eventually this westward movement tends northward as they reach Ross Island and the western side of the Ross Sea proper into deeper trench around Terra Nova Bay - from where they move north again onto the 'slope', thus completing the cycle. What do they eat? Literally anything… As part of our research during the years I have worked down here we have examined the stomach contents of many thousand Antarctic toothfish. They are non-selective and voracious feeders – we have found many species of Antarctic fish in their stomachs - some of which have been fresh enough to supply as museum specimens to Te Papa. They also eat, squid, prawns, skates, the remains of penguins killed by leopard seals, we find rocks, in fact just about anything that they encounter and find remotely interesting and that will fit between their stubby toothed jaws ends up inside. Interestingly there are records from krill trawlers and whalers from the past era of commercial activity that indicates that these large fish do not restrict their activities to the bottom but move up and down in the water column. The lack of a swim bladder which suits rapid vertical movements and the fact that they see using natural light rather than having a yellow filter on the eye (as is the case for many species adapted for the deeper sea) supports this. The fishery catches them on the bottom in water depths from about 800 to 1700 metres deep. The New Zealand fleet working in the Ross Sea region have gained Marine Stewardship Certification. This is a reflection of the effectiveness of the CCAMLR management system, an independent evaluation of the sustainability of the stock, and a clear tick to the vessels’ responsible operations. The effect of this is that another body additional to CCAMLR is monitoring our advances in knowledge and management of this precious resource. Which leads on to the next blog – Fishing and the Antarctic Environment.